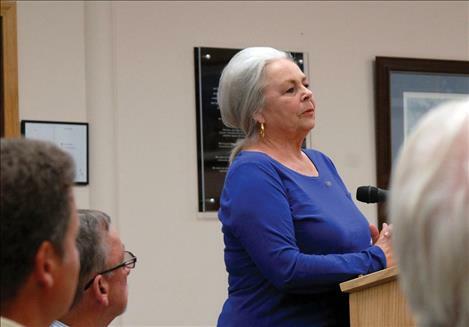 Joyce Norman speaks to the city commission regarding the minor subdivision she and her husband were requesting. Developer Dennis Duty discusses possible impact fee modifications. 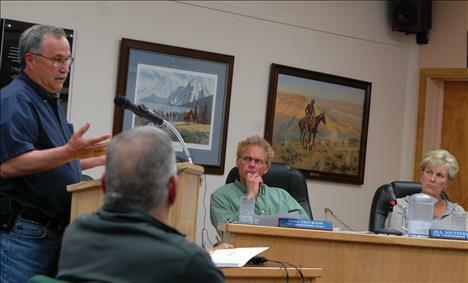 POLSON — Impact fees for new construction came under scrutiny from the Polson City Commissioners at their May 18 commission meeting. Impact fees are what people who are building new houses or businesses in the city are assessed to pay their part for water, sewer, fire, parks and administrative work. Polson’s impact fees are figured by the square foot for commercial buildings, but are a flat fee for home construction. In 2013, Polson lowered their impact fees 80 percent to encourage building; in 2014 they raised them up to half of the original fee. For a new house at the 50 percent rate, impact fees are $3,586.80. Polson Finance Officer Cindy Dooley said the lowered impact fees caused a total loss to the city of $299,730, with $86,971 loss in fiscal year 2015. Dooley said she would like to see them at 100 percent. “I greatly disagree with you, especially with first time home buyers,” Commissioner Steven Turner said. Commissioners discussed the issue, asking if fees for water and sewer could be raised and the parks and fire left the same. The matter was tabled, and the questions will be answered. Dooley will complete compiling a comparison chart of neighboring towns that have impact fees. Hamilton’s fees are about $2,000 more than Polson while Livingston’s are about $2,000 less, she said. In other business, commissioners approved the preliminary plat for the Norman two-lot minor subdivision by a vote of 4 to 3. The 1.89-acre property has a residence on each lot, so the minor subdivision would bring it into compliance with Polson city growth policy and zoning. Both lots would need to connect to city sewer, according to the conditions put forth by the city; they are already connected to city water but each must have its own meter and line. During city manager comment period, Mark Shrives said the city currently has bid packets out for the golf cart storage building, which are due at 1 p.m. on May 29. He said road construction would move onto Fourth Avenue for the downtown looping water project that is replacing old water pipes and mains. The project it running a bit ahead of schedule, Shrives said. Shrives added that the City of Polson received a Treasure State Endowment Program for $750,000 for the waste water system; a $125,000 Department of Natural Resources and Conservation grant also for the waste water system as well as a $7,150 grant for a growth policy update. Commissioners broke a tie between Paul Briney and Lou Marchello and selected Briney to be the seventh member of the Economic Development Committee and Dooley as the staff representative. The group held its first meeting on May 20. The last item on the agenda was Tracy Nash proposing an urban chicken ordinance. Allowing chickens into Polson city limit made it through first reading in 2009 but was voted down on second reading. Shrives played “Chicken Dance” on his iPhone as Tracy approached the podium, adding a touch of brevity to the meeting. Tracy had done research, looking up chicken ordinances in surrounding towns including Missoula, Whitefish and Kalispell, which Mayor Heather Knutson asked to have forwarded to her. Polson Police Chief Wade Nash, who is Tracy’s husband, said he was in favor of chickens. Shrives said this should be forwarded to the City County Planning Board for a discussion, to amend it or add it to the rewrite. The next city commission meeting will be held on June 1 at 7 p.m.